Here's the place to learn about the history and culture of Burgundy. 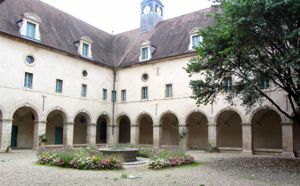 The Musée de la Vie Bourguignonne (Museum of Burgundian Life) is housed in a beautiful cloister of the former Bernardine convent. It's a bit south of the center of Dijon in the Ste-Anne District (map), and is an easy walk from the Place dee la Libération. 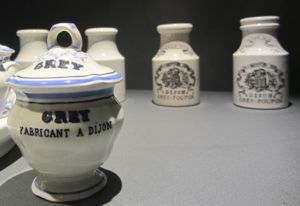 The Museum illustrates everyday life in Burgundy from the 18th to the 20th century. 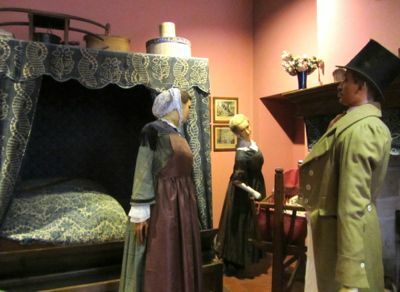 The main floor consists of scenes of everyday life, with lifesize figures dressed in period costume and demonstrating weddings, work, and family life. Examples are drawn from both rural and urban life in Burgundy in the late 19th century. Scene of family at home, Musée de la Vie Bourguignonne. The next floor provides a series of reconstructions of about ten typical shops and businesses that would have existed in Dijon from the end of the 18th century up until World War II. Exhibits include a beauty parlor, the Pernot Biscuit factory (which closed in 1963 but is still a popular subject of posters); a watch maker, and a pharmacy. There is great attention to detail, giving you a sense of how these businesses functioned. Some businesses are supplemented with video footage that helps explain their operation. Other exhibits focus on important area industries such as mustard and wine. Mustard production started in the Dijon area in the 13th century, and Dijon Mustard has long been a desired commodity. Historic mustard pots and equipment show the importance of this industry to the region. And of course wine is an essential part of Burgundian life, and it is featured in exhibits and photographs as well. The top floor looks at characteristics of Burgundian life and includes some wonderful photographs of traditional crafts and work. The Museum, which opened in 1982, also hosts special exhibitions focusing on specific aspects of Burgundian life. One such exhibition looked at the variety in bonnets worn by women over the years in different parts of Burgundy and in different stages of life. The Musée d'Art Sacré (Museum of Sacred Art) is located next door in the former Bernardine Church, with its distinctive green dome. Like other museums in Dijon, the Musée de la Vie Bourguignonne is free and closed on Tuesdays. Most of the signage is in French, but there guides in other languages are available to provide some background information. Above, Courtyard of the Musée de la Vie Bourguignonne. Below, Mustard jars of M Grey and M Poupon, before they joined forces to create Grey-Poupon. 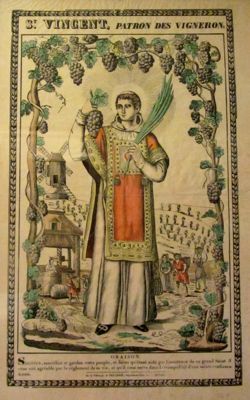 Above, 19th century poster of St-Vincent, patron saint of wine.